Most characters need a sense of identity for me to be able to play them beyond the start levels, without a sense of their hopes and dreams, their hobbies and hates, I tend to abandon them. My Worgen Druid had the opposite problem. I had a clear personality and history in my head, I knew what she looked like both before the bite and after but I couldn’t quite get my head around the sniffles and the vacant puppy look from the front teamed with rabid, rolling eyes and fangs from the side. Thanks in part to Mr Harpy’s decision to level a new warrior rather than transfer his existing one, plus the fun which is running dungeons at the correct level with just two people, Mentzelia has managed to make it to level 82 and Deepholm. I come from a long line of green fingered gardeners, unfortunately I don’t seem to have inherited it as the only things I seem to be able to grow are herbs and cacti but because of that, the idea of the Harvest Witch took root in fertile ground. 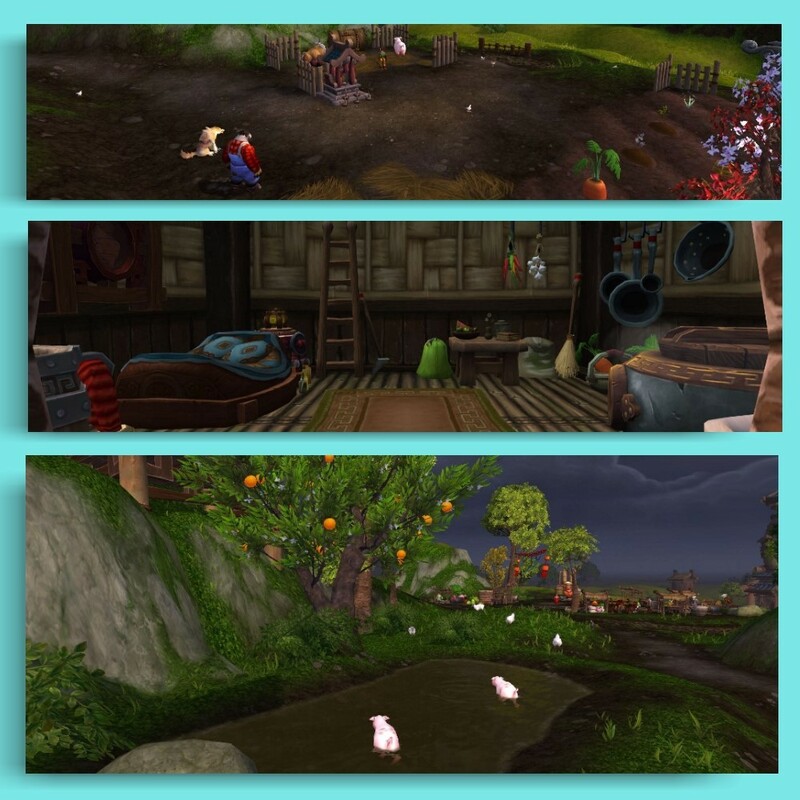 Even before she was attacked, she preferred solitude, wandering from village to village helping farmers with their crops for a bed and a good meal, throwing in a fortune telling by the fire. Now she finds the company of Humans uncomfortable, knowing she holds a mirror up for them, showing what might come to pass. That said, she still pursues the life she knew before, traveling from farm to farm, homestead to homestead, helping where she can, her crow and her cards her only necessities. There is a practicality about her, dark clothing to hide the mud and the blood. When you walk the borderlands between life and death, it’s not just your green fingers people pay for, but birthing skills both livestock and children. She’s drawn to the spaces in between, hedgerows, hollows, glades inside forests, the places where most people quicken their pace and glance backwards not sure what they’re looking for but glad it’s not in view. The scythe serves two purposes, the reaping of crops done properly with skills handed down from generation to generation but also it symbolizes the acceptance that death is merely apart of the circle. We all live and then we die, our blood and bones serving to fertilize the earth. 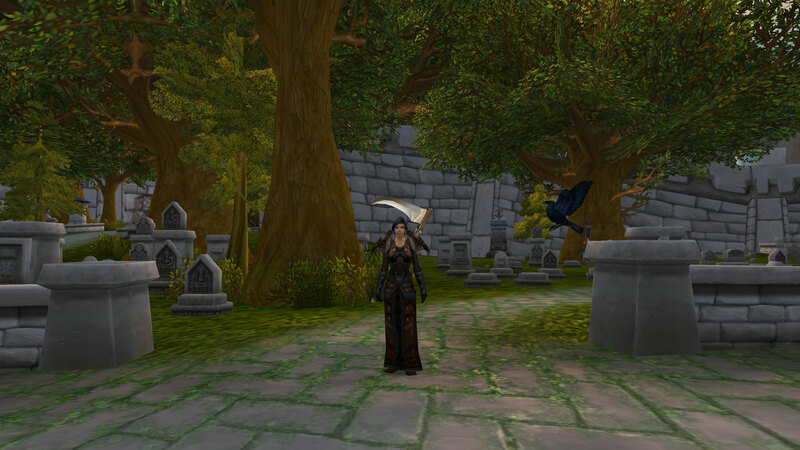 When needs must and she has to visit Stormwind, she spends as much time as possible lingering amongst the dead. Reading the cards in the shade or conjuring flowers on the graves of the forgotten, her crow watching from a headstone or perched on a branch. Gilneas is her true home though and she spends far too much time wandering the ruins remembering the life she had before it was all ripped away. Visiting the farms, now deserted or deep underwater where she learnt her craft at her Grandmother’s knee. The rose bushes she helped cultivate to help a local lad snare his heart’s desire are along gone, even magic can’t defeat salt water but the memories of them, their petals red as blood remain. Those trips to the marshlands to obtain herbs for fevers and climbing cliffs for hardy plants clinging by a root to the rock face, these are all memories which belong to another, to the woman she was before someone made her a wolf. Control can be learnt, the ability to twist her body in foreign shapes well that came naturally enough especially when practised under cool and calming Nightelf eyes, when your normal state is somewhere between a Wolf and Human, becoming a whole cat, a whole bear, a whole stormcrow, that’s easy. 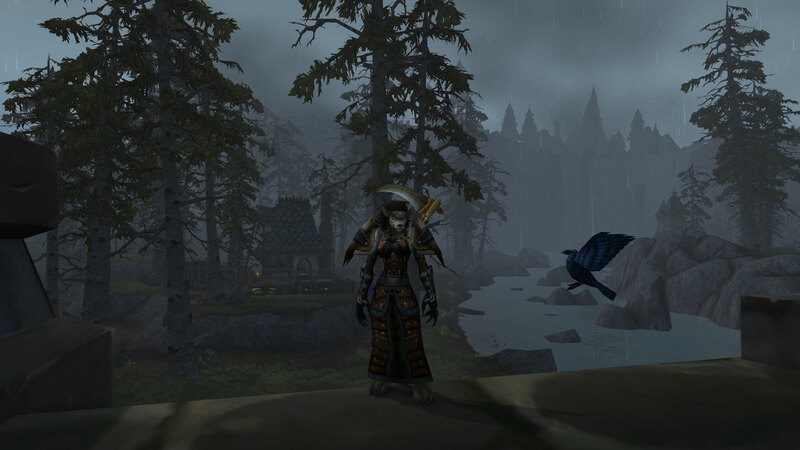 It’s the borderlands, the in-betweens, the shades of grey where the danger lies, not wolf, not Human but Worgen. 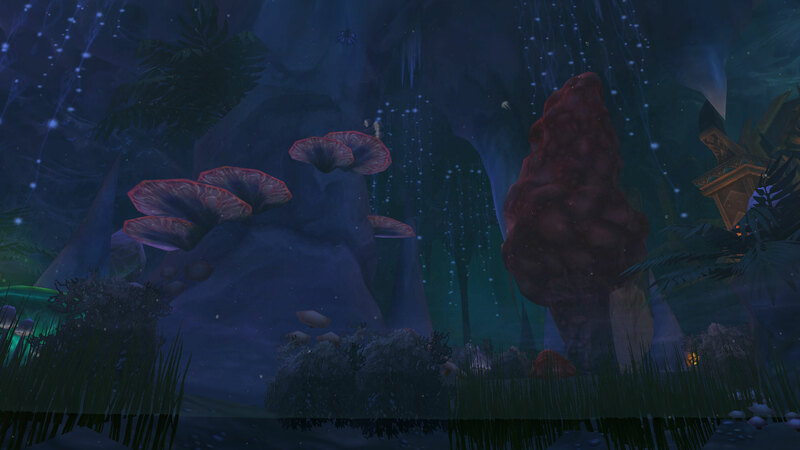 Gilneas too reminds her of the dark days before they “cured” her, when she was nothing but her instincts, the need to hunt twisted and made pleasurable by that undercurrent of cruelty which lies buried deep in most. Now, those instincts are suppressed… unless they run as that suggests the chase, suggests prey and sinking your snout deep into gushing blood, tasting the iron tang on your tongue and knowing that what you’re lapping up is life itself. She knows that many of her kind avoid their birth place like the plague, not wanting to be reminded of what they did, of what they became before Krennan Aranas managed to reign in the sanguine darkness but that’s why Mentzelia makes her pilgrimages. That basic understanding, that need to remember who we are and what we are capable of is crucial to both the people of Gilneas and also to the Witches of the Harvest, spells whispered once in secret, passed down from mother to daughter can now be voiced aloud but the message underlying the song murmurs never forget and never drop your guard. If I ever get around to transferring my sketches for a Warcraft Tarot set from scraps of paper into real cards, the Harvest Witch would I think be the the Hermit, with the rocky cliffs of Gilneas behind her and one of those wonderful orange lamps in her hand. You will need a Silver Proving Grounds medal in a given role in order to queue for random matchmaking for a HeroicWarlords dungeon. 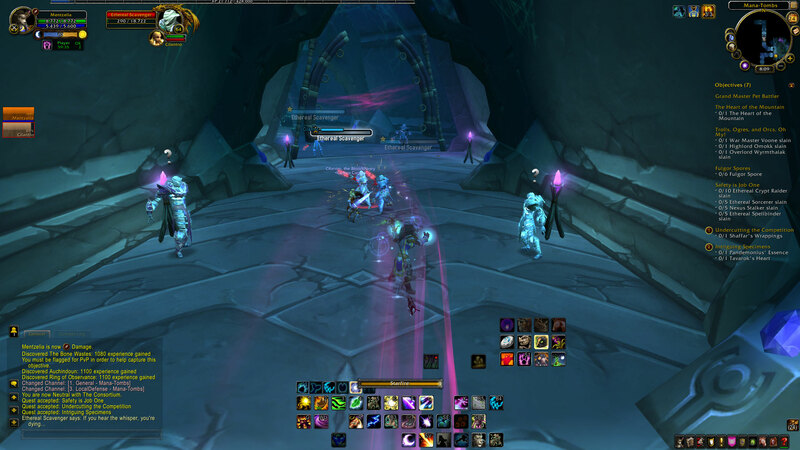 If you form a premade group, you can zone in regardless and no such requirement applies. To begin, I’m not knee-jerkingly against this nor am I super excited. I don’t (unlike a fair number of WoW Insider’s readers) think that the sky is falling but I’m not convinced that it’s the correct way to fix the cesspit which random encounters can often be. I do on the other hand enjoy doing the Proving Grounds but that’s because I find it interesting to try and push my characters. 1. You need to try harder. 2. You need to play better. Now I fully subscribe to the principle behind this comment, there is always room for improvement and certainly on a personal level I’m far harder on myself than anyone else but the truth tends to be that certain classes perform better than others in certain situations and trying harder will only get you so far. I imagine it will be possible to get silver on every class and spec in-game but the skill cap is likely to be higher on some than others, remember for example at the start of TBC when Paladin tanks made the Shattered Halls seem trivial compared to the other tanks. Then there is the discrepancy between specs within a class and their scaling potential. Mr Harpy only plays fire on his Mage (long story don’t ask) and admits that despite having easily obtained gold on his dps monk that he would find it well nigh impossible to repeat that feat on his Fire Mage because Fire needs a far higher item level to come into it’s own than the capped Proving Grounds. Should he however give in to the cold side, I suspect he could tick it off on his Mage. 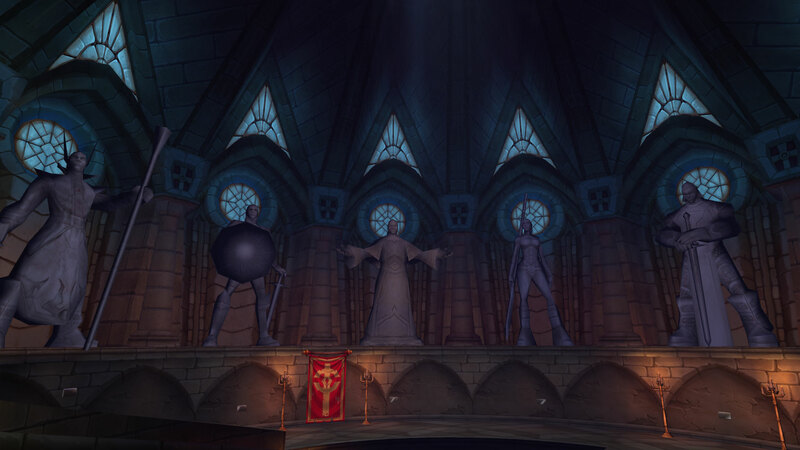 My Priest is Holy, I’d rather play Shadow than Disc but it’s likely that when we’re newly dinged, one of my available healing specs will be easier to hit the mark than the other simply because of the nature of the game. This perhaps becomes more of an issue as the game progresses through an expansion. By the time we’re two or three patches down the line, class balance will have changed especially to factor in how some perform with the max item level available and it’s here we might start seeing the real casualties of this change when newly dinged players on a class which scales too well with gear start trying a gear capped encounter. It really depends where the bar is set. However in most of the Heroics I have been dragged through, I haven’t needed to cc anything unless I was two manning it as a tank and healer combo (whilst it was current content of course). I’d also say that the Healing one focuses too much on mana control, something which is not needed to such an extent in any other aspect of the game. People need to be invested in doing something for the right reasons otherwise the game becomes a chore and massively frustrating. I’d also say that people have to be in the right and receptive frame of mind to learn the proving grounds lessons, otherwise it’s nothing more than a paper exercise. You learn the required answers, you tick them off and promptly forget them. There is also the argument that it’s only the really challenging lessons which teach you anything and therefore if Silver is tuned too easily then it’s pointless for 99 percent of the community. Of course the opposite then runs the risk of being impossible for far too many of the player base but then there are ways around that, like playing with guildmates. Silver needs to be required on every character you wish to queue with, at least until part way through the expansion in my book. Enchantments and gems are a big part of the problem in random content, people are focused on the fact that they will get better, shinier, purpler stuff so don’t bother with the entry gear and this is part of the mindset which needs breaking and rebuilding. The armory provides a list of what is missing as a sort of mini audit of your character and you shouldn’t be able to queue to the proving grounds making sure the basics are covered. There is also difference between classes, even when covering the same roll and this is especially true of melee versus caster dps. I’m far better at playing casters than I am melee dps and certainly I imagine that getting silver on say a Mage or a Warlock would be considerably easier for me than doing so on a Rogue or Warrior. Therefore I should have to prove my mettle as a bare minimum on the type of dpser I wish to queue to random Heroics on but ideally on a character by character basis. If your guildmates can carry you regardless and there is no bar to entering any other form of content, I question what’s the point. 5 mans are indeed a part of the game and I know from most “normal” people, that they encompass a large part of said game but if we’re trying to tackle the obnoxious, the lazy and the “don’t give a damn” brigade then surely this needs to go further. That’s before we even look at the potential for cheating this. Back in Vanilla with the Hunter quests, one of my Guild’s hunter’s completed the quest chain for alts, random Hunters on the server and pretty much anyone willing to supply their log-in details and pay his often fluctuating price. The cynic in me could easily see this happening again if it’s hard enough to be worthwhile. I know Mr Harpy and of course the seller of so many bows didn’t have an issue completing said quest but so many others did. All of this is semantics really because I don’t do Heroic Dungeons as I’m too scared that there will angry people who will blame me rather than looking inward if we can’t stampede the whole place in three seconds flat but I feel that Proving Grounds whilst fun shouldn’t be linked so much to getting gear. The biggest issue I feel with random group activities is the rage you often find there and this won’t do anything to fix that, in fact people might actually be worse because they feel that as Blizzard have effectively “gated” content that everyone should be able to play better. Perhaps a more productive use of Blizzard’s time would be make leveling require a bit of thought, even if it’s only between levels 90 and 100 so that people hit the level cap with an understanding of what their class is capable of and more importantly that overwhelming desire to be the best they can be. 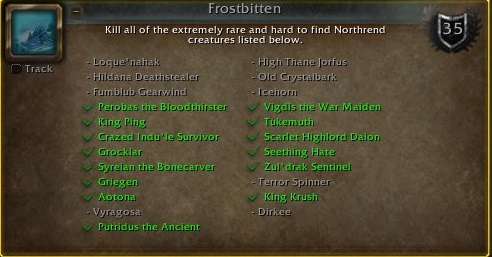 (new additions are blue, completed items are in red). Reach 14000 achievement points. Currently at 13565 with plenty of achievements almost finished. Get a Magical pet to 25. Done. Basil the Twilight Fiendling has reached his 25th season. Get an Elemental pet to 25. Done. The annoying Audreytwo otherwise known as the Singing Sunflower also reached the level cap. Defeat Garrosh and my stupid lack of self confidence at the same time. I beat him in Hearthstone.. does that count? Make a decent amount of gold to enter the expansion with. I hate being broke even more than I hate farming. 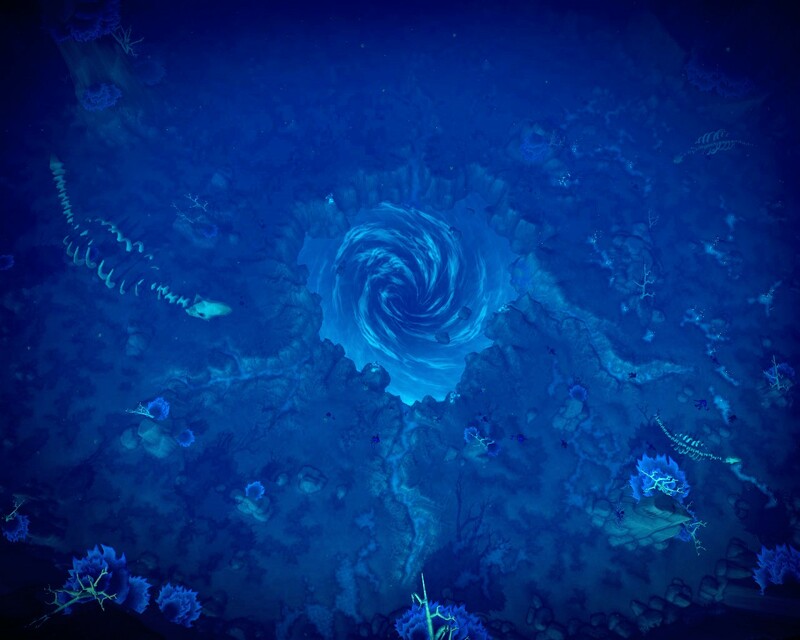 Explore Vashj’ir properly. This is the only exploring achievement I still haven’t completed. Done by my Gnome rogue so now I never need return unless I want to! Make friends with everyone on the farm. Done and as it turned out, it was surprising easy. I just spent a few minutes flying around in between doing the cooking daily as well as heading to the Valley for some between battlegrounds buried treasure pick ups. Complete rank 6 in the Brawler’s Guild as a Mistweaver. Done. I’m now working my way through rank 7. Get Endless Healer on the Proving Grounds. Master of Alterac Valley, only 33 graveyards to go. Collect Oracle Eggs until one miraculously turns into a Dragon. Fish up the remaining coins I need from the Dalaran fountain. Argent Tournament goodies. I need more tokens to be able to buy the mounts I still have outstanding. Still quite a long way to go here although I did score myself a Unicorn Mount. Briarrose is my long forgotten original Druid currently rusting on a massively imbalanced (not in her favour) PvP server, stuck at lv 73 she needs some love mostly because she has awesome bits and bobs in her bank and can rightfully wield the original vanilla PvP set. Sure the Druid version isn’t my cup of tea but I am rather partial to the staves so she needs to find herself some Boomkin gear and get slaughtering. Finish farming the Oshu’gun Crystal Powder I need (in the region of 300ish) to grab the two Halaa mounts. I already have the tokens you get from pvp, it’s just the grind I’ve been putting off. 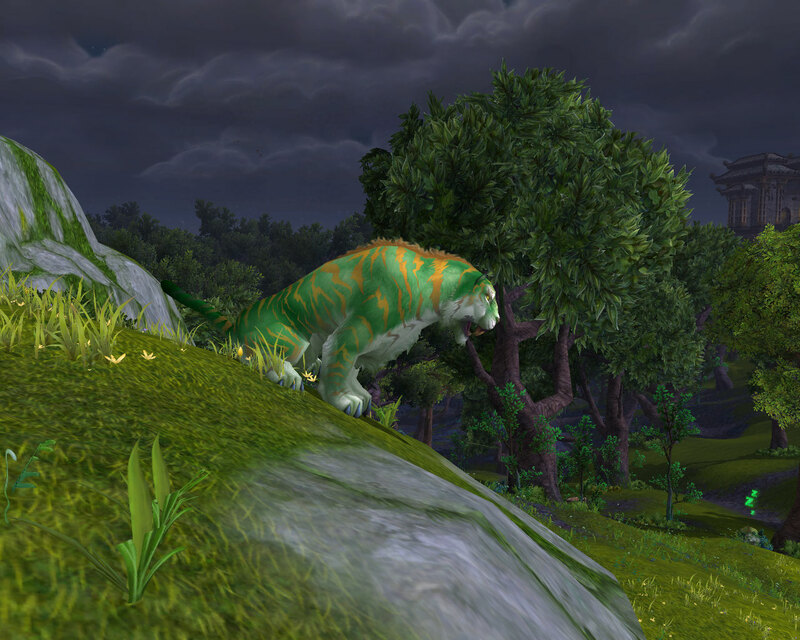 Level so that I can tame one of these beauties. Very much a work in progress. She’s currently level 30 and parked in Ashenvale. I’m off on holiday from Thursday onwards so am hoping to tick off quite a lot of this list, focusing especially on the alts.